Can the Tampa Bay Ferry Live After its Trial is Over? Ferries used to transport people across Tampa Bay. Now plans to bring ferry service back to the bay area are moving full steam ahead. Before the Gandy Bridge was built in 1924, multiple vessels ran between Tampa and St. Petersburg. 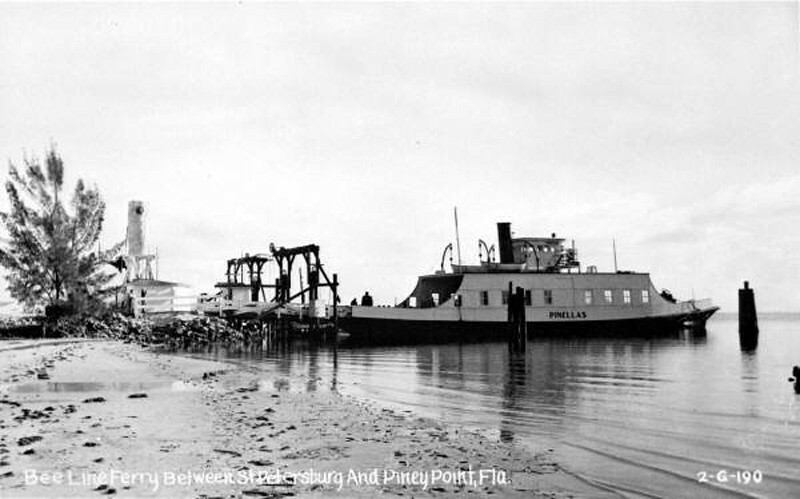 And just a few years later, in 1926, the Bee Line Ferry initiated service between Piney Point and St. Petersburg. Before the first Sunshine Skyway Bridge was completed in 1954, a one way trip from Manatee County to Pinellas County was nearly 70 miles. It required drivers to go north on US 41, through Tampa, and cross Tampa Bay on either the Gandy or Courtney Campbell bridges. The Bee Line Ferry shortened the trip to just 22 miles and less than one hour. The round trip fare was $3.00 for a car and all of its passengers. There were four different boats in operation at peak times, but even then, waiting times could be as long as three or four hours in high season. The ferry went out of business shortly after the Sunshine Skyway Bridge opened in 1954. Nearly 60 years later, plans for new ferry service in Tampa Bay began surfacing. In 2011, the Hillsborough County Metropolitan Planning organization (MPO) commissioned a study on the feasibility of waterborne passenger transportation services. The most promising route from the first phase was found to be between Gibsonton and MacDill Air Force Base. A second phase, completed in January 2012, determined that up to 600 riders might use the service during the morning commute. However, five vessels would be needed in order to attract that many riders, such that 15 round trips (20 minutes each way) could be completed during the two-hour period. Shortly after the study was completed, former Hillsborough County Commissioner Ed Turanchik began publicly pitching the idea of using ferries to shuttle employees at Mac Dill Air Force Base to and from southern Hillsborough County, where many lived. Turanchick had been working with HMS Global Maritime to flesh out the idea. It was determined that the ferries could also be used to connect downtown Tampa and downtown St. Petersburg when not shuttling employees to and from the base. However, the concept now being floated is service between downtown Tampa and downtown St. Petersburg. The proposal was to use high-speed catamaran ferries that could go 30 miles per hour, and could transport up to 2,400 passengers a day. Turanchik noted that the ferry would not only relieve congestion in some areas during peak hours, but could stimulate tourism and offer opportunities for residents and visitors alike to see the bay up close. But the plan began running into some rough waters. First, Turanchick’s group wanted $24 million in public money to get the service up and running. That would be $10,000 per passenger, assuming that their highest ridership projections materialized. Environmentally-sensitive lands on the east side of Tampa Bay made finding a terminal location difficult. But fast forward to 2016, and the idea of passenger ferry service in Tampa Bay is still afloat. The City of St. Petersburg selected HMS Ferries to begin a six-month pilot project running passenger catamaran service between downtown Tampa and downtown St. Petersburg. HMS operates ferries in several locations across the country, including the Mayport ferry in Jacksonville.